What's Best For Making Kites? 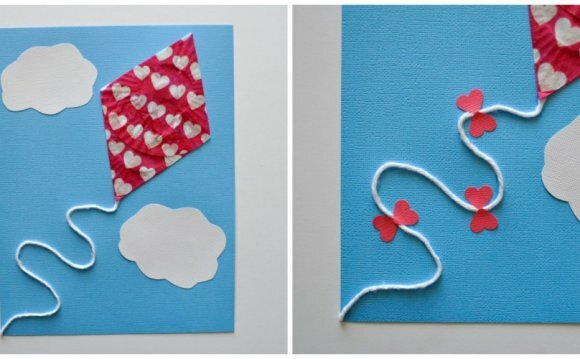 Kite paper can be just about any kind of paper, but making kites fly really well requires more than just ordinary writing paper. The main properties required are strength and light weight. Gift wrap's not bad. Having said that, I'm going to touch on the whole variety of paper used in modern kite-making. Modern paper kites cover the whole range, from super-quick designs that barely fly, through to carefully crafted traditional kites that shoot up high on the barest puff of wind. In the photo over there is a long stack of traditional Taiwanese kites we saw at the Adelaide Kite Festival one year. Tissue paper and bamboo construction, all attached to a single flying line. Many years ago, the very first kite I ever bought from a shop was an Indian design. Made from colored tissue and bamboo, it was an exceptionally good flier over a wide range of wind strengths! So, in general, what kinds of kites are made with paper sails anyway? A few moments with my thinking cap on resulted in 3 very broad categories, to answer that question. Going back to at least the middle of the 1900s, kites for children were available in shops. The bulk of these used paper for sail material. Although shop-bought kites now use mainly plastic or nylon, kite-making workshops for kids still often feature paper or tissue for sails. Here, the range of options is pretty wide. For a kite with a frame, such as a Diamond or Rok, almost anything works to a degree. As long as it is not so porous that it lets air through! A perimeter line goes around the tips of the spars, and the paper or tissue is made slightly over-size. Hence, the sail can be folded over and pasted down around the edges to help keep it flat and resist tearing. Gift wrap, such as this from Amazon. Not to mention a host of other materials that are not wood products, such as Mylar and Cellophane. Not surprisingly, this approach tends to result in . minimum performance too, but that doesn't stop of people enjoying the thrill of making something themselves and then seeing it fly! Long tails are often required to keep the kites stable, and they won't fly at all in light winds since the paper and tape can be rather heavy. Of course, kids can always tow them around to make them fly. The majority of these kites probably fall into 2 categories - Sleds and Paper Planes. Yes, one of the most well known of these does look somewhat like a paper plane, except that a bamboo skewer or straw is taped across it to function as a horizontal spar. Due to the small size of these designs, most of them can be flown on cotton sewing thread lines. What's the most commonly available kind of paper on the planet? A4 or Letter sized sheets of course, as commonly used for photo-copying. These are too heavy for great performance, but can be coaxed to fly as proven by the kite designs already mentioned. In fact, the picture up there is our Paper Sled design. Crafted from a single sheet of A4, and precious little else! Any reasonably thin and stiff types of paper could be tried, and should work to a degree. For example wrapping paper, which could have some great patterns pre-printed on it. However, flimsy tissue or crepe paper won't work at all since it can't stay flat without a lot of help.